In June, the cruising season in Europe is starting to get hot! Temperatures in the Mediterranean are high, and there will be many ships and itineraries to choose from sailing all over Europe! The Norwegian Fjords, Baltics and Scandinavia will also be popular during this time. There are many other destinations that you may consider for your June cruise. We have fantastic cruise offers for June ready to book today! Take a look at the fantastic Cruise Deals in June we have, and give us a call if you need any further information. Why Choose a Cruise in June? June is a fantastic month to book a cruise for. It’s the time when piazzas are starting to get packed and beer gardens aren’t quite yet bursting at the seams. It is also the time of year when the Mediterranean starts twinkling handsomely from dawn to dusk, inviting us to come bask in the sun and enjoy a sangria or two. As the continent starts the beginning of its busy season, it’s a great place to enjoy a hot weather adult-only holiday, before the really busy school holiday season kicks off. Whether you're looking for a short break or wanting to get away for a longer holiday, June is the perfect time of year to sail to beautiful destinations in some of the best temperatures of the year. Our wide range of June cruises offers plenty of variety in terms of length and destination to ensure you can find your perfect voyage. Whether you want tropical sun, natural landscapes or a place with a fascinating history, June is a prime time to travel to some of the world’s most iconic cities. From incredible value-for-money cruise and stay holidays to last minute cruises, all-inclusive deals and our popular Smart Packages, Cruise Nation has a deal to save you money on your dream cruise holiday. With added extras, including flights, drinks packages and accommodation, you can get even more value for money with our great offers and deals. So, pick a date from our selection of bestselling June cruises, grab your diary, and pencil in a magnificent holiday to remember. June is the best month of Summer to enjoy in Alaska without the risk of running into school holiday crowds. You also can't go wrong visiting Alaska in June as the days are long, nature is in full bloom, and the air is alive with energy. Alaska's sky is light nearly all night long from late May to late July. A good way to find out what to expect during your trip is to use one of the many daylight calculators that you will find online. Also keep in mind that June 21 is the longest day of the year, with 19 hours of daylight in Anchorage, 22 in Fairbanks, and 18 in Southeast. Experts say that mid-June to mid-July is the absolute best time to visit Alaska. Having said that, the weather is very changeable and the best way to deal with it is to adopt the same attitude as the locals. Alaskans have learned not to let weather interfere with their plans or mood by knowing exactly what to wear in Alaska. You can book a Cruise Nation cruise to just Alaska or you can super-size your trip and start out in the USA and going up the coast to Alaska. North America’s vast landscapes are also extremely pretty this time of year, showing off its summer glow and offering a whole host of music and other festivals. The Mediterranean, one of the most culturally rich and exotic destinations in the world, from the ancient stone villages and sunny beaches of Portugal to the mystical eastern flair of Turkey. Whether you’re seeking stunning landscapes, splendid cuisine, or a new cultural experience, there’s something for everyone on a June Mediterranean cruise. And the wonders of the Mediterranean are closer than you think when you book your cruise through Cruise Nation, especially on our no-fly cruises from Southampton. From there on you can choose whether you want to circumnavigate Italy, ply the waters of the Iberian peninsula, island-hop in Greece and sail east to Turkey. While it’s impossible to name all our highlights, there are two main Mediterranean cruise areas you can choose from. The Western Med is bordered by Spain and Italy and includes Sardinia, Corsica and the Balearics. The Eastern Mediterranean, on the other hand, covers the eastern side of Italy, and includes Greece, Croatia and Turkey. June is one of those months where you can go to absolutely anywhere in the Med and enjoy a terrific warm holiday in the sun. The Caribbean continues to be a popular region for cruise holidays throughout June, even during the wet season. Take advantage of the many cruise lines visiting the islands during this month and enjoy a tropical climate, ideal for relaxing on countless pristine beaches in the sunshine. Although the official hurricane season runs from June to November, most activity is only seen from July until October. Summer humidity levels begin to pick up in many islands during June, and on average, about 10 days will see some rain this month. The rainiest weather is going to be found in the more northern islands, including Cuba and the Bahamas, while the driest islands will be in the southern region Aruba, Bonaire, and Curacao, which are at the end of the dry season. The possibility of storms and the fact that the US schools are still in session for the first half of the month means that this is the time of year to enjoy a warm Caribbean cruise on a budget. Fewer tourists mean that you can enjoy quiet beaches and also make use of the slightly cooler temperatures in the north, such as in Bermuda and the Bahamas. The Mediterranean is famous for so many different things that people sometimes overlook the pleasure of being able to see a variety of wildlife here. A treasure trove of marine life plies the Mediterranean waters, including swordfish, tuna, dolphins, and even a few white sharks. Loggerhead turtles and endangered monk seals can be found along the coasts of Albania, Greece, and Turkey. Birdlife is also plentiful. Portugal, Spain, and Morocco have populations of storks, flamingos, pelicans, spoonbills, and egrets, while golden eagles and giant black vultures can be found in Greece, and Albania and Montenegro are home to the rare white pelican. The Far East is a great June cruise option to enjoy captivating cultures and remarkable regions. Cruise Nation has a wealth of Far Eastern cruise options in June but one of our most popular is a 15-night holiday departing on 3rd Jun 2020 sailing aboard the Diamond Princess departing from Kobe and stopping at Okinawa, Miyake-jima, Taipei, Kobe, Kochi, Kagoshim, and Busan in South Korea. Taipei is definitely a Far East highlight, its beauty lying in its blend of Chinese culture with a curious fusion of Japanese, Southeast Asian and American influences. As it gets really hot in Summer, June is probably the last reasonable month to go. Definitely add some lightweight clothes and an umbrella to your list, as this city often gets hammered by rain. Discover incredible value and savings with our June 2020 Cruise Deals! One of our favourite and best cruise destinations in June is Italy, visiting ports such a Bari and Naples. The urban city of Bari offers grand boulevards and cultural heritage that includes several castles, a large university and an opera house. Known for its delicious cuisine, you should try the local ‘cucina barese’ in one of their trattorias. Summers offer several fairs which makes this the perfect time to visit. When you dock into Naples, you will receive a royal welcome with a medieval castle, a royal palace and a fortress, all on view on the hillside. Head up the rich volcanic soil of the towering Mount Vesuvias, the only active volcano in mainland Europe, and savour some of the must lusted-after yet deceivingly simple Neapolitan pizza, made with tomatoes and mozzarella cheese. 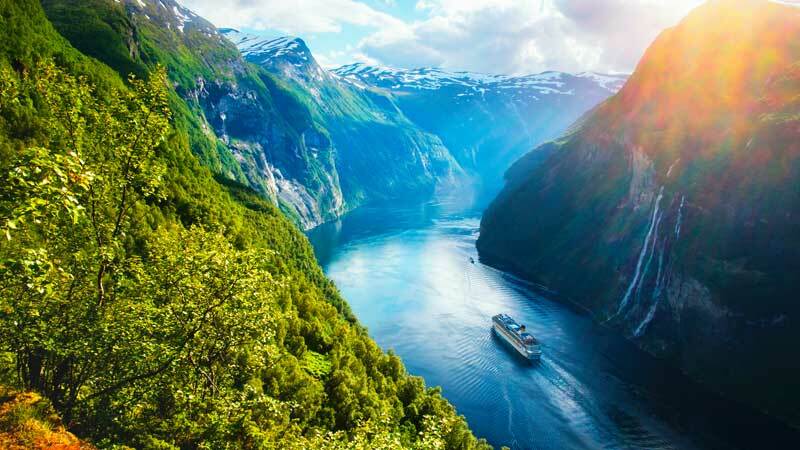 Set sail for the majestic region of Norway, with stunning landscapes and incredible sights to see all in comfortable temperatures to relax and bask in the sun. This is the most popular time for Norwegian Fjord cruises and the time that has the most cruises available. It gets hot, to between 25 to 30 degrees in mid-summer and days are really long. This allows for extra time to explore the scenery, especially in Northern Norway where the sun never sets in summer. It’s probably one of the few places in the world to experience the world of the midnight sun. Cruise season in Alaska runs from mid-May to mid-September and Cruise Nation offers several excellent cruise itineraries in June. While Alaska has many highlights, Skagway is our favourite port for an authentic Gold Rush-era experience. Skagway conjures up images of the ‘Wild West’ during the gold rush and many of its historic buildings are restored and part of the six-block Klondike Gold Rush National Historic Park. If you’ve got enough time, it’s possible to do a White Pass & Yukon Route Railroad trip on the railway that became known as "the railway built of gold." Or if you only have a few hours, visit Skagway Spirits, a family-run distillery, or for the more adventurous, head out to a hike on Lower Dewey Lake.